Move With Grace is opening a second location dubbed the "Sun Studio" at 431 Myrtle Avenue (left). The original location will be called the "Moon Studio." CLINTON HILL — A new sun is rising for Clinton Hill’s Move With Grace. 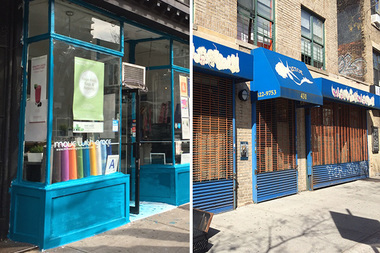 The yoga studio and juice bar, which has been on Myrtle Avenue for nine years, is opening a second “sun studio” just two blocks east at 431 Myrtle Avenue. The space, at the corner of Clinton Avenue, will offer a variety of yoga styles and meditation practices, including therapeutic Yin Yoga and dynamic Warrior Yoga. Dedicated yogis and prospective instructors can sign up for workshops and teacher trainings at the new sun studio. The moon studio will offer a range of fitness classes for children and adults, including ballet barre and Pilates. Both studios will include Move With Grace's signature Juice Bar. The names of the studios come from owner Grace Tappin’s roots in the Hatha style of yoga, which translates to sun (ha) and moon (tha). The sun represents activity and the moon represents balance. Tappin said the new space strikes the perfect balance for Move with Grace. “[It’s] the perfect space for what I envision,” Tappin said. The new sun studio will open April 15.